Photoshop is a tool which every designer is a friend with. They are helpful in designing and makes good edits at every step of the design. It is one of the photo editing tool which is used widely by the designers. This is just not limited to the photo editing but it has incredible usage. A designer has to create new designs according to the trends and keep striving for the best of idea. If you spend a lot of time on Photoshop, through this post we will tell you free Photoshop plugins a designer must know. These plugins will make your designing life easier. You can also see Ui Photoshop Tutorials. Designer needs an icon every now and then. Through flaticon you can find so many icons for free using their free trial plan. It is used by more than 360,000 designers around the world. All you need to do to use this incredible plugin is download and unzip the plugin and run into your system. You can browse through thousands of icons for your design project. You can also go premium with their plans which offers more exciting services. Through random user generator tool you can drag and drop the users. While designing mockups it a designer often need to show users. Creating that consumes a lot of time. By using random user this can be done with super ease. It is a great aid to save your time. You can use toggle to generate male and females and drag the file to your photoshop and there you go. With easy steps you are ready with your design. You must have this amazing plugin with you for an easy work. 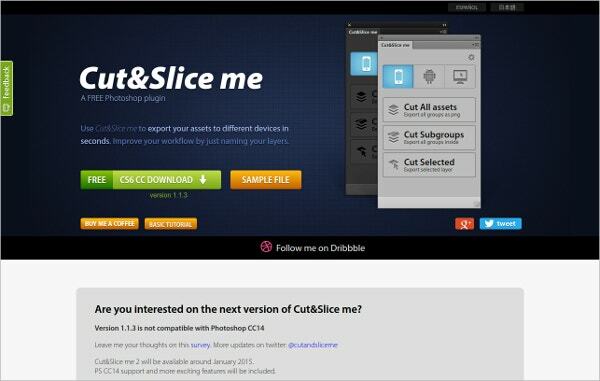 Cut&slice allows the user to export the assets in different devices within a few seconds. With this tool you can improve workflow by naming the layers and it organises the elements just like an object. All you need to to do is add @ the end of the layer. 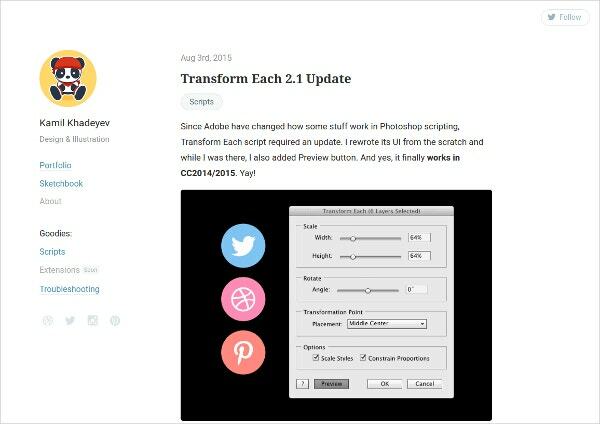 Transform each is a useful tool which has good options out of the box. It has an option for setting pivot or anchor points. It helps in improving work at animations. It is a good script which transforms group of layers and allows the users to resize, reposItion and rotate elements. It is compatible with CC2015, CC2014, CS5, CS6 etc. 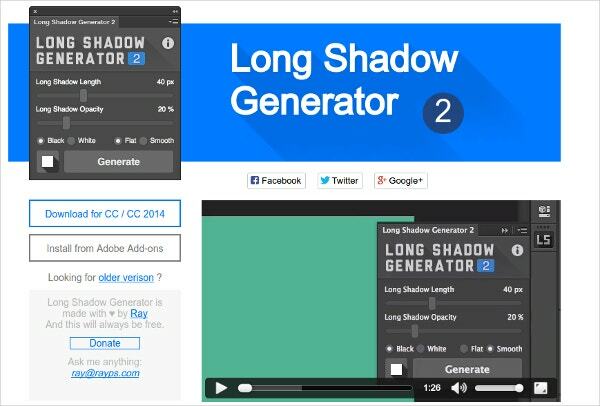 Long shadow generator is an easy tool to design long shadow with the designs. It designs the shadow in an elegant manner giving it a very professional look. It is very easy to design and it has got a tutorial on its landing page which tells you how to use it. Download this plugin onto your system for easy designing. 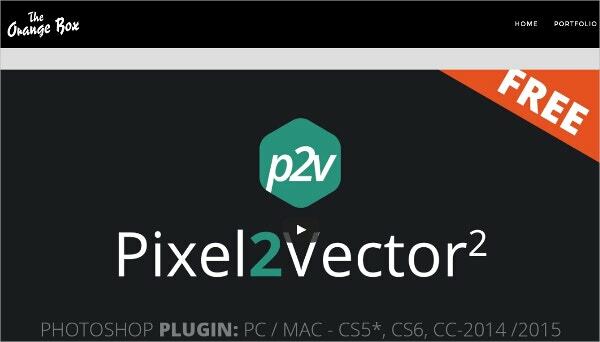 Pixel2Vector Converter is tool which converts pixel shape in a victor shape. It has got good features convert a pixel layer into vector shape or pixel layer. It works on PC and MAC and all kinds of Photoshop versions like CS5, CS6, CC-2014. 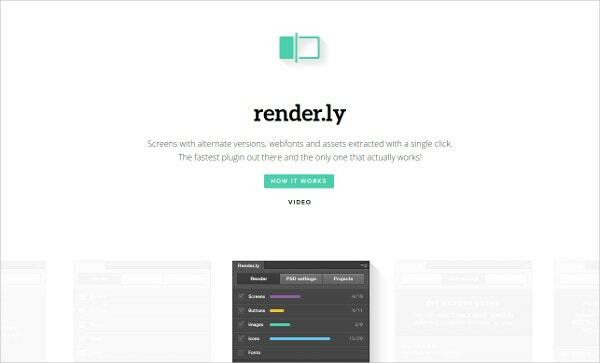 Render.ly is a good tool which helps in exporting screens. It has got a video tutorial which shows how it works. It makes all this happen in just a single click. Check out this amazing tool which will help you to make your work go easier. 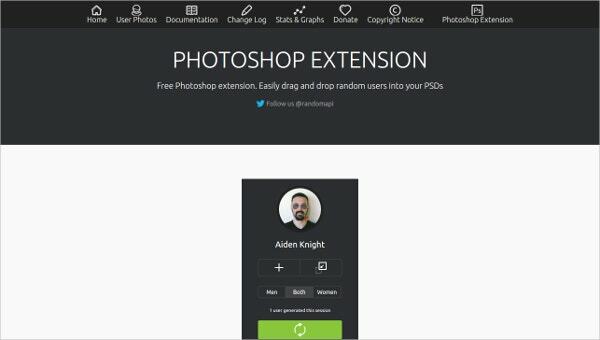 7 Free Photoshop plugins a designer must have in their systems plugins intact. Use these plugins to make your design go unique and these are easy hacks to make your design go notice and your work a lot easier. All the best!